Joel Edgerton is the perfect dad in The Odd Life of Timothy Green. Well, he could be the perfect dad, if he had a kid. But after some bad news from a doctor, he and his wife (played by Jennifer Garner) begin fantasizing about what the child they’re never going to have might have been like — and then, suddenly, that very dream kid magically turns up in their lives and the couple have to put their previously unused parenting skills to the test. 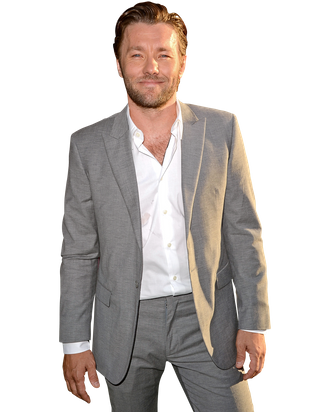 Edgerton, who will next appear in Kathryn Bigelow’s Zero Dark Thirty and play Tom Buhanan in Baz Luhrmann’s recently bumped The Great Gatsby, took a break to chat with Vulture about his inhibitions, camel spiders, and how he managed to get his co-stars lost in the mountains. You’ve seen Juno, right? Don’t you know by now that if you’re trying to procreate with Jennifer Garner in a movie, fertility is going to be an issue? [Laughs.] When I thought of her in Juno, I knew she’d be the perfect person to play this part, because it’s about a deserving couple who really want a child and can’t have one. I [also] thought, I wonder if she’s just someone who comes across as lovely but she’s actually secretly really mean? You know? But the camera doesn’t lie with her. She’s not a meanie at all. I’ve known her for a year and a half now, and I’m still looking for her mean side. [Pauses while he apparently looks out his hotel window.] You know, I’m in Beverly Hills right now, and I’m looking out the window at all the people running around, and I’m wondering, What if the adults were more like kids? What a strange world that would be. People would have no sense of embarrassment or shame, because kids don’t know what shame is — they have to be taught. I really like kids. I find it strange when people can’t relate to kids, because you were a kid once, you know? And they’re not future- or past-dwelling; they’re really in the present. And they’re playful and they use their imagination. So if the adults had no sense of embarrassment or shame, I think we’d see a lot of silly walks. And people wearing shorts on top of their jeans. No inhibitions. Is that what you’d be doing? The recital scene in this movie reminds me of the one in Little Miss Sunshine, when Olive’s family all get up to dance with her. It reminds me of About a Boy, which Peter [Hedges] also wrote! I think some directors have a running theme in their body of work, in which they keep making the same movie over and over again, or thematically exploring the same threads. And then they find actors who can skip along the same path. I think for me, even though Warrior and Animal Kingdom were more action movies, they also subconsciously draw upon the theme of family, which must be why I was drawn to them, and to this. I’m not saying I’m a family guy, but maybe that’s what people see in me, some kind of paternal quality. Do you think of The Great Gatsby as a film about family? Because Tom Buchanan is a father, too. He’s a lousy husband and an unloving father. You almost forget he and Daisy have a little daughter, because she just pops in occasionally but is looked after by the nanny. They’re not really parenting. Tom’s a rogue, among his other unsavory qualities, but he’s still a man, a human being with feelings. I strive for that connection, to understand him. It’s not for me to rewrite F. Scott Fitzgerald and make him likable, but at the same time, I think he can be understood — which makes him an ever-greater obstacle to Gatsby. The Great Gatsby takes place in New York and Long Island, but you shot it in Sydney, Australia, your backyard. Did everyone turn to you for recommendations or directions? Absolutely. Tobey [Maguire]’s still lost out near the Blue Mountains. [Chuckles.] You know, I’ve spent so little time in Sydney lately, that it was fascinating even for me, the evolution of the city, how some restaurant had changed hands, or some new building was up. But there’s nothing scarier than being a tour guide in your own city. There’s a difference between recommending a restaurant to your friend’s cousin and recommending it to Leo [DiCaprio]. Because his needs are different. Does it have a Bat cave? Are there tinted windows? A back exit? That kind of thing. Was it hard to readjust from being pampered on The Great Gatsby to camping out in the desert for Zero Dark Thirty? You’ve turned down a lot of roles recently. Weren’t you supposed to reteam with your Zero Dark Thirty co-star Jessica Chastain in The Disappearance of Eleanor Rigby double feature? And didn’t you have a shot at Jeremy Renner’s role in The Bourne Legacy? That one wasn’t my decision. I would have happily done Bourne Legacy, but a lot of decisions are made for you. But sometimes, I can’t imagine myself serving the project well, or I don’t find them as challenging. I couldn’t do Eleanor Rigby because it was clashing with another project, something I was going to go do something with Liv Ullmann. But now that’s not going to happen, at least not this year. You make the best choices you can. And my writing fits in between the cracks. Actually, that’s what was a little disappointing about being in Jordan, that I couldn’t plug in my computer and wile away the hours when we were just sitting around. If I’m working on writing and producing a project, then I’m constantly engaged. But when I’m just acting, I might work for five minutes, and then wait for hours for them to reset all the lights and sets to redo one take. If I’m going to work for twelve hours a day, I want twelve hours of awesomeness!